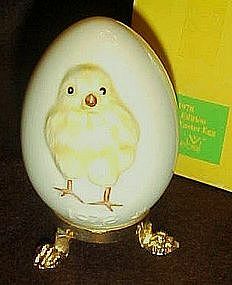 This is a wonderful First Edition Goebel Egg ~ Chick in the Goebel Easter Egg pattern. 2008 marks the 30th year that Goebel has been producing this traditional Easter Egg. Here is your opportunity to complete or begin your collection of beautiful Goebel Easter Eggs. The egg is white porcelain and measures 2 3/4 inches and then sits on a gold tone base and legs which measure 3/4 of an inch. Making the whole egg ornament stand 3 1/2 inches tall. On the front of the egg there is a cute fluffy hatched chick and 1978 showing thru the glazed egg. The bottom is marked with the Goebel W. Germany mark. This egg is in excellent condition. This comes in the original box.